Android 7.0 Nougat is out of its Beta Box. Now it is made available for qualified Nexus smartphones. While checking out the major innovations of Android 7.0 Nougat, you might have missed certain minute features. When you hear about features of Android 7.0 Nougat, the features that may come to your mind includes Multi-Window, JIT Compiler for Faster Booting Times, Notification Shade Redesign, Daydream for Virtual Reality, Vulkan API Support and lot more. But there are certain unknown features that you may have missed on which I would like to have a few words. Facial Recognition was there in upto Kitkat version. After that it was absent in Lollipop and Marshmallow. Again it was included in Android 7.0 Nougat. When you press the Power Button of the smartphone, it automatically scans your face and gets unlocked. The process is simplified than the one existed earlier. But you can’t use this Facial Recognition for making purchases using your smartphone. 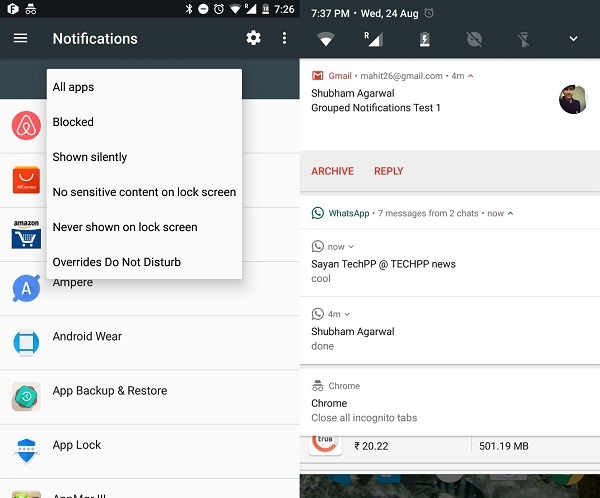 When it comes to Android 7.0 Nougat, the notifications got grouped together under a specific application. Using this you can scroll down with your fingers after a specific alert. This will help you to look into each and every message specifically. Android 7.0 Nougat is added with a feature called Quick Reply, which exactly works as it sounds. If you get two messages, you can either archive them or reply to specific message of your choice with the help of this newly added feature. Android 7.0 Nougat has been revealed with enhanced security features. One such feature to protect the data on your handset is File Based Encryption. This will ensure security for your files and folders in the smartphone. The problem is that you have to individually enable this setting for each file or folder separately. Otherwise once this feature is enabled, entire files and folders on the list get encrypted. DPI means Dots Per Inch. It refers to the clarity of content and how large or small they appear on the display. Before Android 7.0 Nougat, customizable DPI was available only on rooted devices. But Google has incorporated this feature on Android 7.0 Nougat. With this feature you can set how big or small the contents to be appeared on your smartphone. The developers of Android 7.0 Nougat has innovated Settings Menu with an innovative Navigation Drawer. This is placed on the left and it will help in switching from one screen to another. The main screen thus shows lesser informations such as battery status. Also the appearance of battery and data details has been improved. The overall design is modified and appears to be lote more modern. The Recent Screen is embedded with Clear All Applications Button. This will let you to clear all those applications that you have used recently from the Recent Screen. The above are few tiny features that you might have missed on the main list of features of Android 7.0 Nougat. If you come across any such additional features, you welcomed to share about it with us.